A penny doesn’t seem like much. You may have passed a penny on the ground and not bothered to pick it up. But enough pennies can be significant. In Spartanburg County, pennies are leading to the county’s largest-ever public investment. Voters across Spartanburg County in 2017 approved a six-year penny sales tax to fund a new, $152 million judicial center with 85 of 93 total precincts supporting the plan. At January’s Caffeinated Conversations, Spartanburg County Administrator Cole Alverson shared the first designs of the 330,000-square-foot, six-story federal-style building. An update on the sales tax was also shared with projections coming in ahead of schedule. The new courthouse will be bigger, safer and more thoughtfully laid out for everyone who has to go through the space. The current courthouse presents some security issues, as judges, jurors, lawyers and those charged with crimes all intermingle in common areas because of a lack of open space available in the building. “We’ve flat outgrown the Courthouse,” Alverson said. Along with the new courthouse, plans call for a parking area on Library Street just across from the current building. 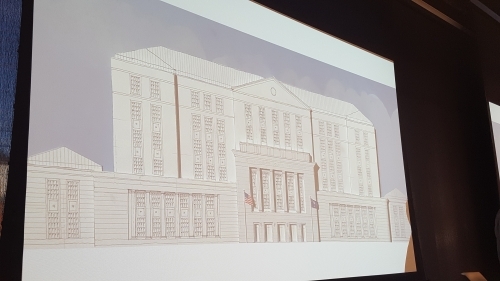 The new courthouse will have more than a dozen courtrooms and space for Clerk of Court functions, Sheriff’s Office court security and holding, Solicitors Office employees, Public Defenders, Probation and Parole staff and Juvenile Justice officials, among others. Alverson provided a floor-by-floor look at how the new space would be laid out, from courtrooms to office space for solicitors, the new facility would give the county’s judicial officials more space to work and a much more modern, safer space to do it in. “This building doesn’t just have a use of 35 or maybe 40 years, it has a life of 75 or maybe 100 years,” Alverson said. The investment is likely to jump beyond just the Courthouse building, though. The new facility and the facelift it would give the corner of Magnolia and St. John streets is likely to spur other investment, further catapulting downtown Spartanburg into the future. Smith brought up the history of Greer’s City Hall, built downtown at a cost of more than $20 million. That investment brought increased private investment to Downtown Greer, leading to new businesses and a revitalized downtown area. The penny sales tax would lead to more than $220 million in downtown Spartanburg, which will revitalize an entire city block and lead to even more private investment funneling into downtown. The financing of the project has been pay-as-it-goes, meaning as penny sales tax revenues come in, that money is allocated to projects related to the courthouse and other facilities. “Spartanburg’s citizens will not be taking on mountains of debt and paying millions of dollars in interest,” Smith said. The penny was so crucial for Spartanburg County’s future that not only did County and City council work closely together, but the heads of the Spartanburg County Republican Party, the Spartanburg County Democratic Party and the Spartanburg Tea Party all announced their support of the plan before the Nov. 2017. That kind of collaboration is a signature of Spartanburg, and has laid the groundwork for a major piece of Spartanburg’s future. Prepared by the Spartanburg Chamber.